The only thing more annoying than Bill Murray’s movie Groundhog Day, are the insipid clichés it has encouraged. Every morning in the movie, Murray’s character awakens to a day exactly like the previous day, which happened to be the most celebrated time of the year for no one we know, Groundhog Day. Monday was a red-banner event for Colorado pols and activists, who tried, and failed, to link the day in a clever way to their political bent. 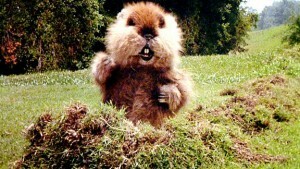 #GroundhogDay and another health care reform repeal; there has to be a punchline there somewhere. Yes Diana, there is a punchline, and you all are it: The House was not scheduled to vote Monday on Obamacare, that vote is today, which is not Groundhog Day. Jeez guys, get your clichés straight. Not to be outdone, the anti-gun brigade was out in force at the Capitol yesterday to protest Republican attempts to roll back controversial gun laws, employing as their weapon of choice, clichés. Further muddying the cliché, the groundhog pictured on the podium above does not appear to be the Groundhog Day groundhog, but the Caddyshack gopher assuming the”I’m alright” pose.